With local newspapers seemingly unable to make the switch to an online world and dying off like flies, the concept of the “hyper-local” news site has taken off. The genre has a attracted the attention of big media with AOL pouring millions of dollars into building a network of thousands of Patch.com hyper-local sites and MSNBC acquiring everyblock.com, a smaller (16 sites) hyper-local network. Founded in 2010, Oakland Local (OL) is different. 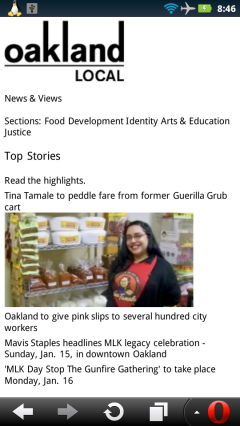 Published by a community based, non-profit organization, it’s an online news source for Oakland California, residents. Updated around the clock by an all-volunteer staff of eight, OL is credited with breaking the story of Iraq War veteran, Scott Olsen being critically injured by a police projectile during the repression of the Occupy Oakland demonstations. OL carries no advertising and has an annual budget of under $60,00 which comes from contributions and grants. Oakland Local has won several awards including a Society of Professional Journalists’ Prize for for multimedia cultural coverage and is included in the Columbia Journalism Review’s News Frontier Database of the top online news sources. It also provides training and support for local non-profit and community groups staff and members who want to learn journalism and online publishing and social media skills. Hosted at WordPress.com, Oakland Local is mobile friendly. This entry was posted in News Sites and tagged hyper-local, Oakland CA by Dennis Bournique. Bookmark the permalink.